28 www.seniorshousingbusiness.com Seniors Housing Business n October-November 2017 By Jane Adler Investors and owners alike agree that the long-term forecast for seniors housing is noth- ing but sunny. The raw demographics of an aging population are sending a strong buy sig- nal. But dig a little deeper into current market conditions, and the decision of whether to buy, hold or sell becomes somewhat cloudy. Much of today's transaction activity is being driven by a wave of new construction, cou- pled with the fact that the huge cohort of Baby Boomers won't be ready to start moving into seniors housing for several more years. Com- plicated by other factors, such as uncertainty about healthcare legislation, investment strate- gies are being recalculated. 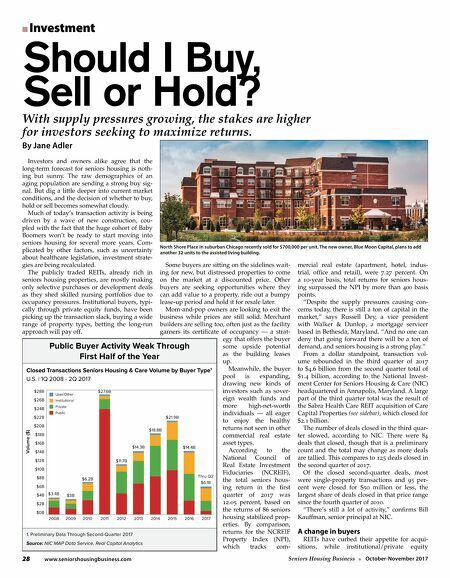 The publicly traded REITs, already rich in seniors housing properties, are mostly making only selective purchases or development deals as they shed skilled nursing portfolios due to occupancy pressures. Institutional buyers, typi- cally through private equity funds, have been picking up the transaction slack, buying a wide range of property types, betting the long-run approach will pay off. Some buyers are sitting on the sidelines wait- ing for new, but distressed properties to come on the market at a discounted price. Other buyers are seeking opportunities where they can add value to a property, ride out a bumpy lease-up period and hold it for resale later. Mom-and-pop owners are looking to exit the business while prices are still solid. Merchant builders are selling too, often just as the facility garners its certificate of occupancy — a strat- egy that offers the buyer some upside potential as the building leases up. 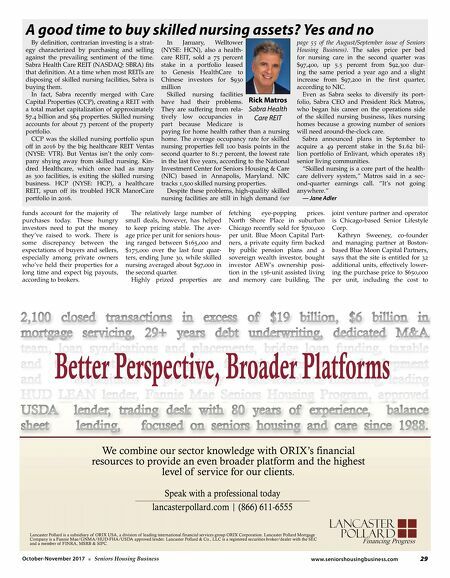 Meanwhile, the buyer pool is expanding, drawing new kinds of investors such as sover- eign wealth funds and more high-net-worth individuals — all eager to enjoy the healthy returns not seen in other commercial real estate asset types. According to the National Council of Real Estate Investment Fiduciaries (NCREIF), the total seniors hous- ing return in the first quarter of 2017 was 12.05 percent, based on the returns of 86 seniors housing stabilized prop- erties. By comparison, returns for the NCREIF Property Index (NPI), which tracks com- mercial real estate (apartment, hotel, indus- trial, office and retail), were 7.27 percent. On a 10-year basis, total returns for seniors hous- ing surpassed the NPI by more than 400 basis points. "Despite the supply pressures causing con- cerns today, there is still a ton of capital in the market," says Russell Dey, a vice president with Walker & Dunlop, a mortgage servicer based in Bethesda, Maryland. "And no one can deny that going forward there will be a ton of demand, and seniors housing is a strong play." From a dollar standpoint, transaction vol- ume rebounded in the third quarter of 2017 to $4.6 billion from the second quarter total of $1.4 billion, according to the National Invest- ment Center for Seniors Housing & Care (NIC) headquartered in Annapolis, Maryland. A large part of the third quarter total was the result of the Sabra Health Care REIT acquisition of Care Capital Properties (see sidebar), which closed for $2.1 billion. The number of deals closed in the third quar- ter slowed, according to NIC. There were 84 deals that closed, though that is a preliminary count and the total may change as more deals are tallied. This compares to 125 deals closed in the second quarter of 2017. Of the closed second-quarter deals, most were single-property transactions and 95 per- cent were closed for $50 million or less, the largest share of deals closed in that price range since the fourth quarter of 2010. "There's still a lot of activity," confirms Bill Kauffman, senior principal at NIC. A change in buyers REITs have curbed their appetite for acqui- sitions, while institutional/private equity Should I Buy, Sell or Hold? n Investment With supply pressures growing, the stakes are higher for investors seeking to maximize returns. Public Buyer Activity Weak Through First Half of the Year 1. Preliminary Data Through Second-Quarter 2017 Closed Transactions Seniors Housing & Care Volume by Buyer Type 1 U.S. | 1Q 2008 - 2Q 2017 Source: NIC MAP Data Service, Real Capital Analytics Volume ($) $28B $26B $24B $22B $20B $18B $16B $14B $12B $10B $8B $6B $4B $2B $0B 2008 $3.4B User/Other Institutional Private Public 2009 $3B 2016 $14.4B 2017 2010 $6.2B 2011 2012 $11.7B 2013 $14.3B 2014 $18.8B 2015 $21.9B $27.6B Thru Q2 $6.1B North Shore Place in suburban Chicago recently sold for $700,000 per unit. The new owner, Blue Moon Capital, plans to add another 32 units to the assisted living building.